Wu-Tang Clan struck Gold (and then Platinum) with their debut Enter The Wu-Tang (36 Chambers). In addition to astronomical sales, the release has been dropped into list such as NME’s Top 100 Albums of all Time, Pitchfork’s Top 100 Albums of All Time, Q’s 90 Best Albums of the 901s, Rolling Stone’s 500 Greatest Albums Of All Time and 100 Best Albums of The 90s, Vibe’s 100 Essential Albums of the 20th Century and the Source’s 100 Best Rap Albums. And that’s the short list of lists. 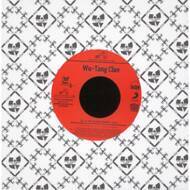 Get On Down will now be issuing every single cut from Enter The Wu-Tang as a 7” single.